Not a member? You should Sign Up. To make the experience fit your profile, pick a username and tell us what interests you. Your profile's URL: hackaday.io/username. Max 25 alphanumeric characters. We found and based on your interests. This project was created on 01/20/2014 and last updated 10 months ago. Please leave a comment in this project to give us your feedback about your Hackaday.io experience. All of us who work on Hackaday.io are reading your feedback. If we don&apos;t get back to you individually, know that we read what you wrote. Thanks for taking the time to give us feedback, we really appreciate it, you help improve the site every day! you need to create an account. Bug report: When I enter an equation into a project log, the equation always shows up at the very top of the text, regardless of the cursor position. Highlighting the formula and copy-paste does not work, so it is really painful to work with those beautiful LaTex style formulas. I&apos;ll ask about the insert position, but copy paste should work, the formula is an image. If all else fails it can be moved in html view. Also we are taking a look at a new equation editor that is svg based instead of images. Hi. I&apos;m Mike V. My profile picture on my profile is rotated 45 degrees clockwise and I don&apos;t know why. If someone here could fix the photo or show me how that would be great. I&apos;ll send you a pm so see whats going on. The photo is probably rotated via the EXIF data. For example iPhone always saves photos in landscape mode, but if it detect the phone is in portrait mode, it simple adds a EXIF "flag" to indicate that the image needs to be rotated by 90 degrees. Most browsers and photo viewer/editor nowadays can handle this, but some don&apos;t. That&apos;s when you get these weird effects/errors. I wondered why people followed my completed projects when there won&apos;t be any updates. Then I realised they clicked on Follow without noting the status. I don&apos;t know what the solution is. Maybe make Completed more visible near the Follow button? I think it&apos;s more likely they think it&apos;s like FB. I can only speak for myself, of course. In any case, more followers for you! Ok that&apos;s a reasonable case. I&apos;m concerned for the people who think they might receive more chapters to my stories. They&apos;ll be waiting in vain. ;) If there are any major revisions, I&apos;d probably call it a new project or post an announcement to .stack. 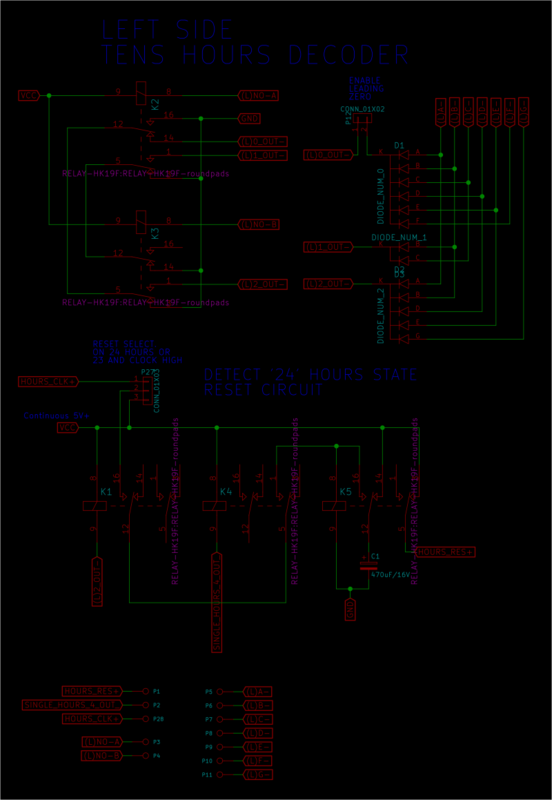 After looking at the relay clock project, and trying to read the code examples and schematics, I gave up. Dark red, dark grey and dark blue on a black background is not conducive to reading. I tried Firefox and IE, both give me difficult-to-read images. There&apos;s also a bunch of boilerplate links at the bottom of most pages that appear in grey-on-black. Can this be fixed (i.e. made more legible)? The black background is edgy, but dark-on-dark is a showstopper. Can you link to a code example? The code editor colors could be improved, but if it&apos;s a user created schematic you could message the owner for maybe a higher contrast example? My Win10 system at work is darker -- even worse. Team names (I notice they highlight when you hover over them, but if you don&apos;t know what they say because you can&apos;t read them, hovering over each one is a pain. I&apos;m not asking for black on white, but a bit more contrast would be nice. Thanks for the quick reply! It is a user created schematic image I would just PM them and ask maybe they have another version. As to the low contrast links I&apos;ll check in with the other devs, thanks! Thanks, Ken -- I thought it was some formatting you guys had done to match the theme. I&apos;ve posted a comment. Editing the schematic was above and beyond! Well I&apos;m just another user like you, not one of the site guys. Can I change my account from being OAuth-based to password-based? I don&apos;t see any flows to do so. Changing password requires a current password even though there&apos;s a button to authenticate with GitHub (which just takes me back to my feed after authenticating, so why is it there?). I can&apos;t delete my account to start over either, because I need a password or to authenticate with GitHub and the latter redirects to my feed immediately after authenticating. Let me know if you need more help. How can I update my email address at Hackaday.io? I use Github authentication and I have changed my email address at Github, but it seems Hackaday hasn&apos;t tracked that. I go to Edit My Account and try to change the address, but of course Hackaday doesn&apos;t have my password so it&apos;s always wrong. Thanks let us know if you see it happen again. Could also try clearing the files cache for hackaday.io. Everything else on the page works AFAIK, just no place to enter instructions and a nonfunctional add-step button. Is it stuck at step 9? Im trying to reproduce the behavior, is it just this one project, can you add instructions and steps to another project? Thanks! It works now on that and other projects. So the problem seems to have resolved, did you change something? Thanks again! Nope may have just been a connection issue, glad it&apos;s working again. I changed my avatar picture some time ago (about two weeks), but the old one is still hosted on cdn.hackaday.io. Will it eventually be removed? The editing package has picked up that .so is a country code top-level domain, and assumed that the libmsp430 bit before it is a domain name… unfortunately in this case, .so simply meant "shared object". When I go to edit that page, the editing software gets confused and spits out the link as HTML inside the <code> block. I wonder if there&apos;s a way to suppress this automatic linking behaviour, as I really don&apos;t want to be linking to random .so domains every time I reference a dynamic library on Linux/Unix. Thanks someone will look into this. I have another suggestion though. In the Feed, when someone comments on your stuff you get a reply banner with a button so you can comment back. It would be really nice to have this same banner in a Like or Follow in the feed so I can say thankyou without leaving the Feed. I dont like opening up new tabs with HaD in them, more than two or three, and hotmail, and I run out of memory for starters. And clicking out and back into the feed is unreliable. Hi. I don&apos;t think the tab order on the log-in screen should be username -> stay logged in checkbox -> password. On most websites I use, it&apos;s username -> password -> submit / sometimes checkbox. You&apos;re right it should be, thanks. I rarely get e-mail notifications for project page comments. It&apos;s been months since I first reported this. Do you guys have a plan to fix it? I almost regret creating my project page here. As far as I can tell this is because of the Hackaday.io one email per hour limit across all notifications. It&apos;s not currently the best solution and we are working to make notifications better. These could come in the form of improvements to the feed or a secondary notification area for example. Thanks, we&apos;ll check it out. Still double notifications. Is there a workaround besides disabling notifications altogether? I am also getting double emails for comment/like/follow notifications. It started happening after I changed my email address, though that could just be a coincidence. The 2x like/follow email issue should be resolved. Thanks again. Got an email notification - only one! Thank you very much, hopefully there will soon be a solution to the missing notification problem, too ;-P Maybe add a checkbox to filter out notifications about project likes or something, it will probably still be under "1 per hour" limit 99% of the time, but creators interested in addressing feedback ASAP will finally get a solution (even a half-working one), and HaD might then become a little more engaging for new users as a result. I still get 2x notifications... Maybe it will fade away tomorrow ? Hackaday is great, but please improve the image handling. The current way to just crop whatever image there is to square is just ugly. And I notice that even if I create a squared image it still gets cropped at the top and bottom. I would really appreciate if images would be scaled to fit the given space instead. It&apos;s not just that. Adding a few images with descriptions in a row (in a log entry) often just makes it impossible to get the cursor under that last image to add new text. Deleting that empty line with BACKSPACE between an image and text? Nope, deletes the image. Using DEL to delete the line? Yeah, maybe. Most of the time also deletes the last image. And so on. Brought up sooooo many times. Nothings happening. Only reason I stick to this place is the awesome community and projects. The editor is a pile of you know what I mean. Switching to html mode to get more possibilities editing your entry?! Editor adds a hundred empty lines... Also mentioned a few times. This is not bound to a special browser. Chrome, Firefox, ... all the same mess. Hey @Ken Yap the background photo is separate, if you edit the project you can upload photos in the left column. The first position is the project thumbnail. On the FPGA bootcamps we use Verilog which isn&apos;t a choice in the code snippet window. I get that it isn&apos;t the usual case to stop the auto detection so I won&apos;t complain about that (much). However, it would be nice to give us an option to set a color for unformatted boxes. As it is all the code is gray (with apologies to the Mama&apos;s and the Papa&apos;s) and it is kind of hard to read. Any chance of being able to set that? I would question if it ought to be global but if not, at least per project or something? So more contrast between the unformatted text and dark background color? I&apos;ll ask what we can tweak there. I like this site and the color theme. Thanks guys. I used to have a cool but but I lost that and my wallet and ID cards when I was put in a mental hospital recently. When you are working on instructions (probably other places too) and you select normal text and press Insert Code Snippet, it works like you think it would (that is, it picks up the text you selected). However, at the end you wind up with two copies of the code. A normal copy and the coded copy usually stuck in the middle somewhere. I see this happening and it may have been intended, there doesn&apos;t appear to be an easy way to undo or extract the code from the snippet. Will check some more, thanks. I don&apos;t know if it is picking up some cursor position in the code block. It doesn&apos;t seem to follow any pattern. Most often there is exactly one line on top and the rest below, but I have seen it randomly have a different split as well. I agree it doesn&apos;t feel right. Made to protect, defend, and attack. Just collecting some information out of curiosity. Does this project spark your interest? You are about to report the project "Feedback - Hackaday.io", please tell us the reason. Hello, I really like your project and I think I have skills to help you. Your application has been submitted. Are you sure you want to remove yourself as a member for this project? Project owner will be notified upon removal.